Sign up for Broadjam today to follow Robert Burton Hubele, and be notified when they upload new stuff or update their news! Musician, storyteller, and blue-collar icon of Canadian life. Robert Burton Hubele has a catalogue of experiences as varied as the stylings of his Bluesy Jazzy songs. The same can be said for his experience of love. 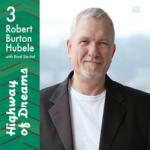 Always a songwriter first, Hubele has created his ninth cd release, Highway of Dreams, which is a musician's kind of Red Shoe Diaries. Highway of Dreams is a collection of dynamic traveling romances both written and guided by the Laws of Attraction which, like Hubele's songwriting, can take people everywhere they never imagined. Interwoven throughout the passages in these songs, there's a continued meeting and parting of movements of the heart and the movement of life. Highway of Dreams works its magic and, from the first note, wins the ears of even the most guarded of listeners. As one in a series of themed albums of Robert's deep-rooted Roots and Blues, what you get is an incredible display of imagination from a truly avant-garde songwriting talent.